NASLite-M2 is a high-performance 32-bit Multimedia Network Attached Storage Server Operating System designed to provide quick, easy and reliable networked file storage for a multitude of networked clients. NASLite-M2 provides media streaming and networked file storage services to Windows, Apple OSX, UNIX and other clients via UPnP, DAAP, SMB/CIFS, NFS, AFP, FTP, HTTP and RSYNC protocols simultaneously. 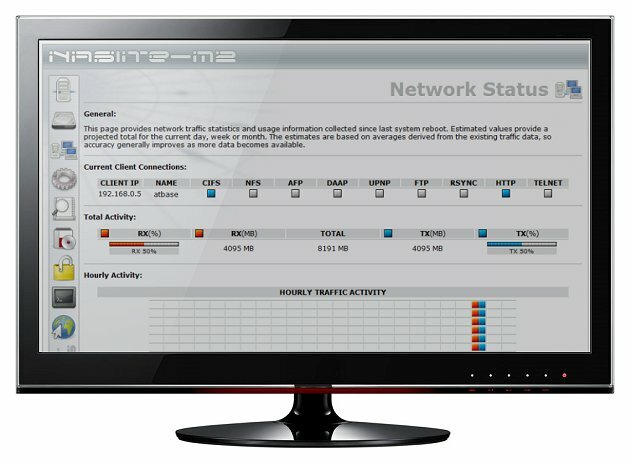 NASLite-M2 is a Multimedia Network Attached Storage (NAS) Server Operating System designed to transform a basic computer into a dedicated UPnP, DAAP, SMB/CIFS, NFS, AFP, FTP, HTTP and RSYNC file server. In addition to conventional networked storage capabilities, NASLite-M2 can natively stream audio and video content to both DAAP (Digital Audio Access Protocol) and UPNP (Universal Plug and Play) network clients. DAAP clients such as iTunes and other Hardware and software-based music players can now stream media from the NASLite-M2 server without the ability to natively mount exported volumes. Along the same lines, UPNP clients such as PlayStation 3, XBOX 360, Windows Media Center, etc. can also play NASLite-M2 hosted content. UPNP streaming is enhanced by profiles targeting DLNA, XBOX, PS3 and Generic media clients directly. NASLite-M2 boots from a variety of IDE, SATA SCSI, USB, FireWire or Hardware RAID devices and is intended for use in any application that requires the simultaneous availability of large amounts of fast and inexpensive networked storage. A single NASLite-M2 server is capable of exporting terabytes of networked storage and can handle hundreds of networked users easily and efficiently, even when running on modest hardware. NASLite-M2 offers unsurpassed versatility allowing full access to all its storage resources. Content can be accessed simultaneously using any of the supported protocols. Fully-automated monitoring and intelligent resource management make NASLite-M2 an excellent performer in high-traffic storage applications. Daily mirror backups between local or remote drives ensure data safety. High performance and low maintenance have established NASLite-M2 as one of the best investments in networked storage. Using NASLite-M2 is simple and a perfect solution for both home and business. By design, NASLite-M2 is a community Workgroup server and does not support features such as user management, disk quotas or the ability to join domains. However, it is very easy to set-up, to administer and to use. For support or additional information on NASLite-M2 and other related products, please review the Documentation and Support sections. Addresses a regression affecting some SCSI/SATA CDRom drives. Perform general code cleanup, tweaks, etc. NOTE: Your NASLite-M2 credit card order will be processed by CEE Network Services using PayPal. Shortly after your PayPal payment confirmation you will receive an email with complete download instructions. The instructions will be automatically sent to your PayPal-registered email address or the email address you provide to PayPal as part of this transaction. Please make sure that the email address you intend to use is valid and working.